I regularly convert many of my emails into tasks, is there a way to create a rule that will automatically convert emails with a specific subject line, into a task? Sure, you can use a simple script that creates a task from an email and use it with a Run a Script rule. We also added a second code sample that creates a task from the message you are reading in the reading pane. To create an appointment from an email message, see Create an Outlook appointment from an email message. Press Alt+F11 to open the VBA editor and expand the tree to find ThisOutlookSession. Paste this code into the VBA editor then create a rule and choose Run a script as the action. You can customize the script to set a category or due date (or any other fields supported in Tasks). To calculate the due date, you'll use the DueDate property and add a whole number to the Received date. If you prefer to change the Start date, you would add a whole number to the start date line. If you use a category that is not in your Categories list, the color category field in the view will be colorless as the category is not in the master list. To use today's date only, not the current time, use Date and decimals to set the due date or reminder time. To copy attachments from the messages to the task, you need to use the CopyAttachments, added to the end of the task macro. If you want to send a Task Request, you need to Assign it and add the Recipient. You can use either the full email address or the GAL alias, or even the person's display name, provided the name can resolve to an entry in your address book or GAL. I recommend using the address only because it can't resolve to the wrong person. If you use the user's name or alias, you may need to Resolve it using code before it's sent. .Assign goes in the With objTask code block, but the Recipient is added outside of the With statement, then it's sent. The DIM statement goes at the top of the macro with the other DIM statements. To assign different categories based on different keywords in the subject, you can use an IF statement for a couple of keywords but should use an array for a larger number of keywords. 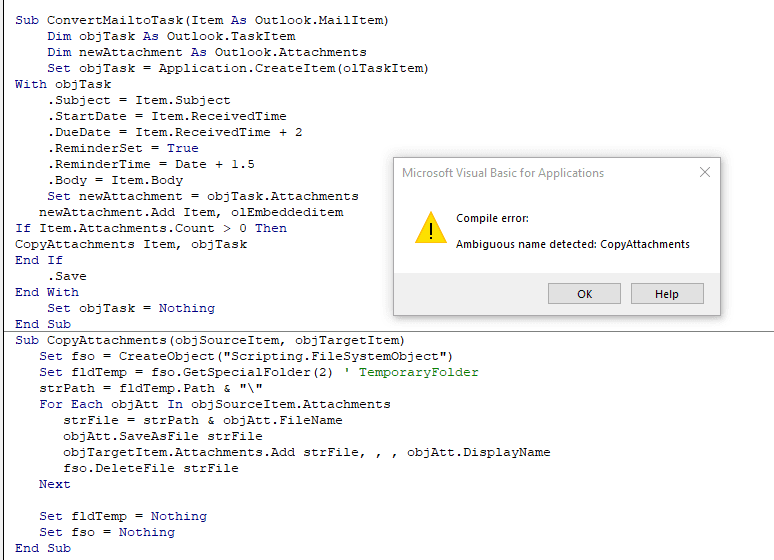 Instructions are at Using Arrays with Outlook macros. You can save the task to a different folder by adding two lines to the code. This example saves it to a Task folder in a different data file, in this case, a Sharepoint task list that is linked to Outlook. You can also use a different folder in the mailbox. When the folder is the same level as the Tasks folder, using the example below. See Working with non-default Outlook Folders for more information. Create a rule using the condition and choose the action "Run a Script", choosing the ConvertMailtoTask script you pasted into the VBA editor. Complete the rule. When a new message arrives meeting the conditions in the rule, the script runs and creates a task out of the message. Jason wanted to know if we could use the code with a button to create a task from a selected message. To do this, we needed to modify the original code just a little. To use it, create a command on the ribbon or toolbar and assign the macro to it. When you are reading a message in the reading pane, you can click the button to create a task. This code doesn't work with open messages, but a little more tweaking can change that. Simply change the Set objMail line to Set objMail = GetCurrentItem() and get the GetCurrentItem function from "Outlook VBA: Work with Open Item or Selected Item". To use, select the message and run the macro. Photo of code attached. I am using Outlook 365. For reference I am using Office 365. Do you receive any error messages? It looks like it should work. After 10 hours of tinkering I was able to get the macro to create the task in my Sharepoint folder.AWEEEEEEESOME SAUUUUCE. What was the secret trick? It may help others facing the same problem. Everything started working fine. The only minor issue I have is the Macro settings in Outlook. When I Sign the macro and set to "Notifications for digitally signed macros..." It does not run. When I switch it back to "Notifications for all macros" it works. Other than that, it works perfect. >> Macro settings in Outlook. When I Sign the macro and set to "Notifications for digitally signed macros..." It does not run. Did you try making a new certificate? Quite a few people had problems after a recent update and had to make a new certificate. I will try that and let you know. Thanks again. Your site has been very useful. Thank you for sharing your script. I was able to get the auto-tasks going just fine. But trying to save or move the task to a Sharepoint Task that I am using for a help desk. I cannot seem to get it to save to the folder under "Other Tasks"
>> I cannot seem to get it to save to the folder under "Other Tasks"
once i corrected some of the statements in the code it cleared everything up. I have a mix of "Set objTask" and "Set NewTask". I used your "GetFolderPath" Function and it all worked fine. Can you tell me how that can be achieved ? Currently I have to manually assign task to team members. I wanted to trigger a mail to my team member and that task should automatically to him/her. I dont want to hard code any email address. I just wanted to assign the task automatically to a person whom I am sending mail to. Is that possible via script ? Yes, you can pick up an address from a message. Hi Diane, I am able to resolve all my issues and now it is working fine for me. However I am not able to Assign task to person whom I am sending mail to. Can you please help me with that ? to the task code? Change .Display to .Send (or send it yourself). If the task is not in your default task folder, it won't automatically update. Hello Diane, made those changes and the red disappeared. However, still not working no task gets created. when I compile the code I get an error Ambiguous name detected. please see attached screen shot. Your help is appreciated. that means you have the copy attachments sub in another module - you only need one copy, any macro that needs it will share the one copy. Delete the one in this module. Hello Diane, i made the correction as indicated but it still not working. I get an error of "ambiguous name detected" when the project is complied as you can see in the attached screen clip. Remove that CopyAttachments macro - you have a second copy of it somewhere. the path as you have it is the data file name in the folder list is "Other Tasks"
To get the data file name and path, right click on the Action_Item_Tracker folder, choose Properties - the path will be there. Don't use the leading \\ in the macro.